Bake: at 350F for 25-30 min. Making cake total: about 2 hrs.25 min. Love your site and the recipes you share. The ingredients are listed here but the instructions are not. I want to print out the recipe and save it but can’t without the instructions. The video is fine but I don’t want to have to watch the video each time I want to make the cake. 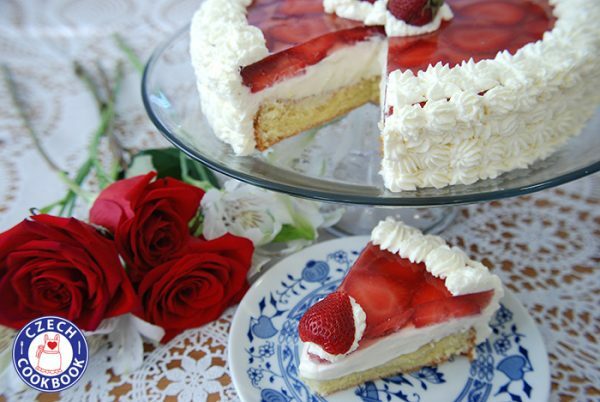 I just loved your Strawberry Cake video you sent to me the other day. I will have to try. I am a Czech just like you. I love all kinds of food and love to try new recipes. The reason I am writing to you is because it’s summer time and potato salad is the staple in the fridge. I am looking for that old time Grandma’s recipe. The recipe that cannot be found because it is in Grandma’s head and she unfortunately is gone. You my dear can make a Potato Salad to kill for. The salad that you go back for a third time. I use to have such a recipe and it’s gone. I don’t know if its red potatoes, white potatoes or russet potatoes. Do you use Miracle Whip or Real Mayo? Pickle juice or some secret stuff. I do not like celery chunks. Celery seed works. Red onion and tons of eggs is a must in my salad. Can this request be possible? PS I’m the guy that sent you the Nadivka recipe a few years ago. I just made this cake twice! Once with peaches and banana’s with peach gelatin and once with whole berry cranberry sauce and raspberry gelatin. They were both a hit in both presentation and taste! Thank you so much for sharing, love watching your videos! Those sounds amazing! I am glad to hear how much you enjoyed it!